Hands on with base ten blocks! 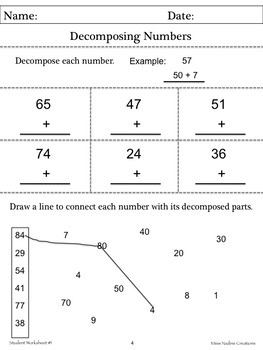 The objective of this lesson is decomposing number. First lesson of 9 lessons with a PPT to teach adding up to four 2-digit numbers with an emphasis on composing, decomposing and regrouping. PPTs include effects so that the teacher systematically guides the students with the base ten blocks. 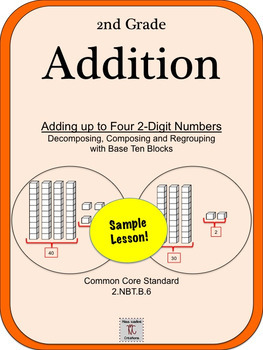 Reinforces place value concepts, mental math and develops skills to move from the concrete to the abstract. - PDF (7 pages) with lesson plan, student worksheets with answers that can be used after each lesson. 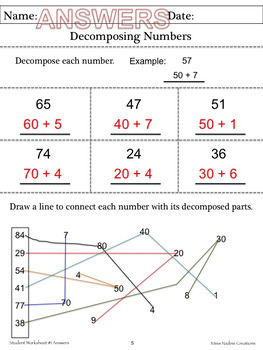 -1 PPT- for the lesson that also includes the student worksheets with answers. Mental math included in most PPTs. If you like this lesson, the 9 lesson Full Version is available.